You’re racing along through Dinosaur Land, trying to rescue Princess Toadstool from the evil Bowser. 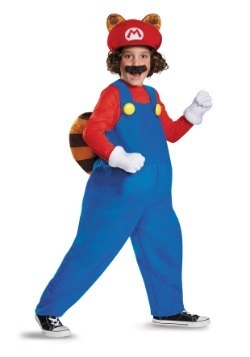 You’ve managed to traverse nearly all of Yoshi’s Island, stomping down Monty Moles, Koopa Troopas and Rexes. Still, there’s a long way to go before you reach the castle—and your foes are starting to pile up between you and the finish line. It’s starting to look dicey… You’re going to need a special weapon if you hope to make it through. Spying a floating “?”, you leap up and hit it, hoping for a super feather or maybe a fire flower. You’re totally unprepared for a green egg to pop out instead. Quickly, it hatches open, revealing… Yoshi! 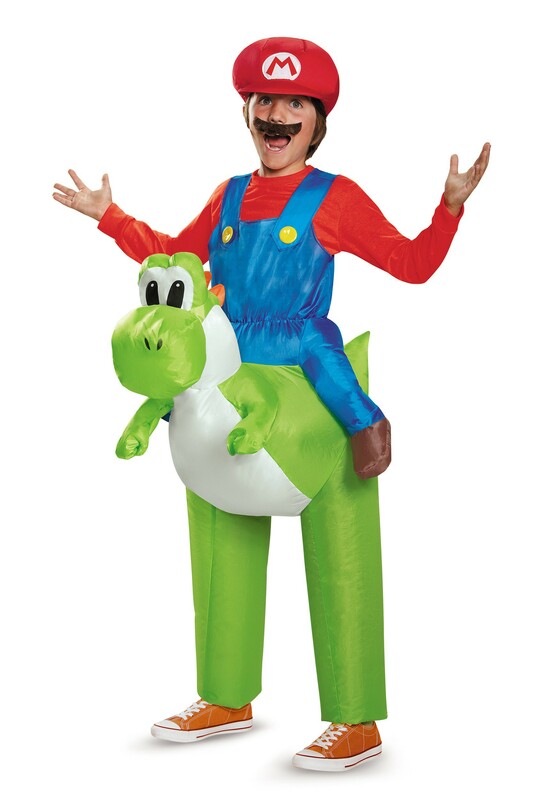 Yoshi is the loyal friend of the Mario Bros., faithfully carrying them around when they’re unable to jump long distances themselves and also using his super long tongue to lash at any threatening Koopas dumb enough to come too close. It’s always a wonderful surprise to discover a Yoshi egg and climb onto the newly hatched dinosaur’s back. 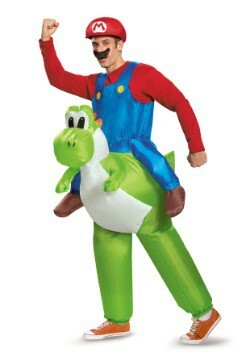 Now, your kid can experience that same joy through this Mario Riding Yoshi Child Costume. Your little gamer can jump into this polyester windbreaker jumpsuit and pull the iconic blue overalls over the shoulders of their favorite Mario-red (or Luigi-green) shirt. 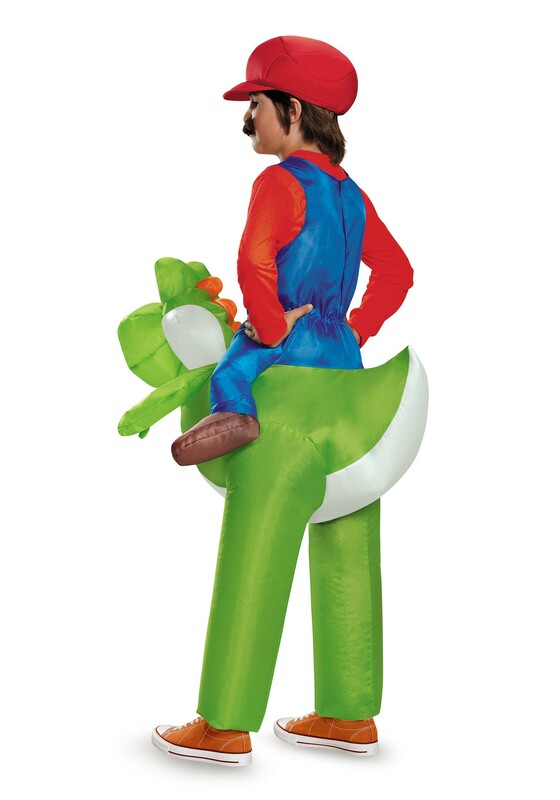 The bottom part of the costume is an inflatable Yoshi body. 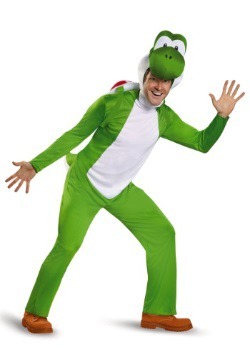 There’s also a battery-powered Super Fan at your kid’s hip, to really offer that authentic Yoshi experience. 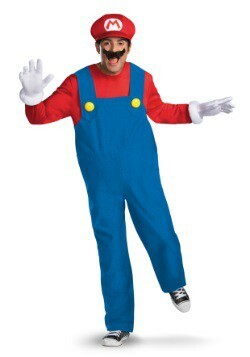 Make sure to pick up a plumber’s hat and mustache to complete the look, and your little tyke will be ready to rescue Princess Toadstool in no time!